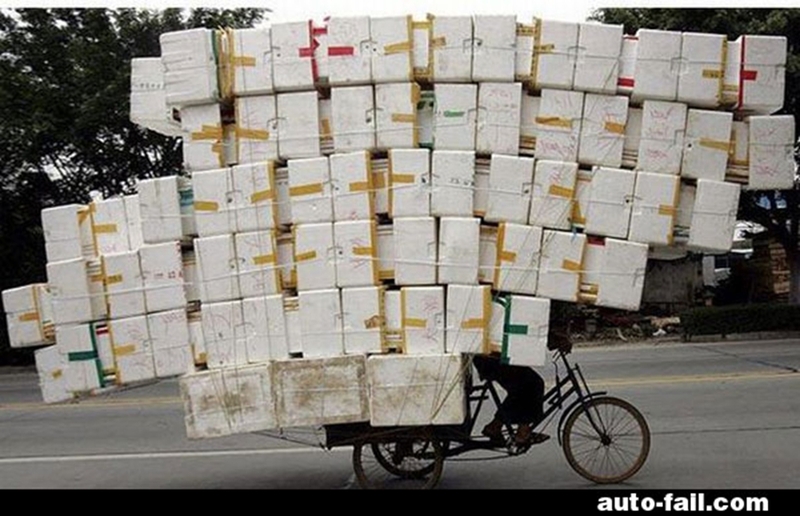 Here you are cycling through life as we can see with some difficulty as you balance all these boxes. You have collected these boxes along the way. What’s in them? Memories of events and people. Not happy memories. Nope. The happy memories you keep in your heart and they do not weigh anything. Let’s have a closer look. In the bottom left hand corner is a box that has your Grade 1 teacher in it. You can still remember how mean she was to you in the first two weeks of school. She would not let you go to the bathroom and you ended up wetting yourself and everyone laughed. You can still remember how ashamed and embarrassed you felt. You have kept that memory with you for 35 years now. Then above that you have different boxes with ex bosses and work colleagues. You seem to have worked with some really horrible bosses and work colleagues. They each have their own box. Then further over is a box with the in laws in it. Truth be told they have more than one box. There is also a box with the ex in it. He doesn’t belong to the in laws who have their own boxes. His parents were lovely and you still see them even though you probably had the worst divorce imaginable and you have made a point of remembering and keeping every detail and comment with you. You got divorced 17 years ago and it feels like yesterday. Then there is a box that has your best friend in it. You found her in the kitchen at a party in your home kissing the now ex husband. That was how he got to be the ex and of course the best friend is most certainly not the best friend anymore. You have so many boxes that you do not know what’s in them anymore. The one from yesterday has the woman who cut you off in the parking lot and stole the parking that you were going to take. You have gone over and over in your mind how you should have handled the situation but instead you never said a word to her. You made up for it by telling the people in the office though what you thought. Every so often you spend your time on stock take and you open these boxes. Not all of them of course. There are too many. You open your favourites and your relive the emotion of those events and those people. You get angry all over again and you rant and rave. Some boxes make you cry and you feel miserable for days after. Other boxes make you cringe with embarrassment. There are boxes that you haven’t opened for years as they hurt too much, but they are there. Carried with you for years and years. They are part of you now. Here is a question. How do these boxes with their painful memories serve you? Truth is they don’t and to be honest they hold you back from finding and using your greatness and slow you down in you reaching your goals. So, why cart them with you for years and years? To be honest they have become part of you. They define you in a way and besides how could you get rid of them? Let’s look at how these boxes are connected to you in the first place. They are connected with chains of pain. How do you break those chains? By being willing to let those boxes go. They do not serve you. Why keep them? Just let them go. Some people would tell you that you need to go and find the Grade 1 teacher and forgive her. But why? Just let her go. It really could be that you were scared and shy and that you thought you had asked her to go to the bathroom, but the words never came out. Maybe she never even knew that you needed to go. Even if you did track her down, chances are pretty good that she will not even remember you. Remember you have carried her with you for 35 years, not the other way around. Your cycle through life will have so much more freedom. How do you prevent yourself from collecting boxes in future? When things happen – and they will, examine the situation, process it; see if you can change the thought which will give you a different emotion and therefore a different action. AND THEN – throw it away. Let it go. Don’t let the person or event try out a comfortable box. Do not be tempted to keep them even if just for just a while. Will you hold me back? Will I reach my goals and deliver on the purpose for my life? If your answers are NO, you know what to do. Toss it. Do not drag the baggage with you. Let it go.